Pixel Film Studios, leading developer of visual effect tools for the post-production and broadcast markets, announces the availability of ProChapter 3D Wedding enabling film editors to incorporate breathtaking 3D presentation environments in Final Cut Pro X projects. 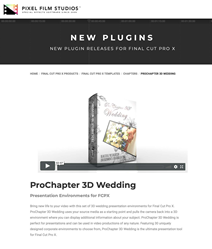 ProChapter 3D Wedding gives wedding photographers new tools to create enchanting projects within Final Cut Pro X. Bring new life to video with this set of 3D wedding presentation environments for Final Cut Pro X. ProChapter 3D Wedding uses source media as a starting point and pulls the camera back into a 3D environment where users can display additional information about a subject. ProChapter 3D Wedding is perfect for presentations and can be used in video productions of any nature. Featuring 30 uniquely designed corporate environments to choose from, ProChapter 3D Wedding is the ultimate presentation tool for Final Cut Pro X.
ProChapter 3D Wedding features 30 presentation environments made exclusively for Final Cut Pro X. This gives users a wide selection of options to use in productions. Each ProChapter 3D preset is ready-to-use in Final Cut Pro, but can be customized and adapted to any project. Use ProChapter 3D Wedding to display a quote, provide a description, or present data. ProChapter 3D Wedding features a variety of customization options that give the user complete control over optimization. Versatility is the key with any ProChapter product. ProChapter 3D comes with a drop-down layout menu so that users may easily select a preset layout for Left, Right, Top, Bottom and Center aligned media. After setting the layout, make further adjustments by tweaking the rotation of the media and the position/rotation of the text. Each preset includes a set of color controls so that change the color of the background, foreground and rear objects. Just find the Hue/Saturation controls or find the Tint color pickers included in each respective section to easily change colors.